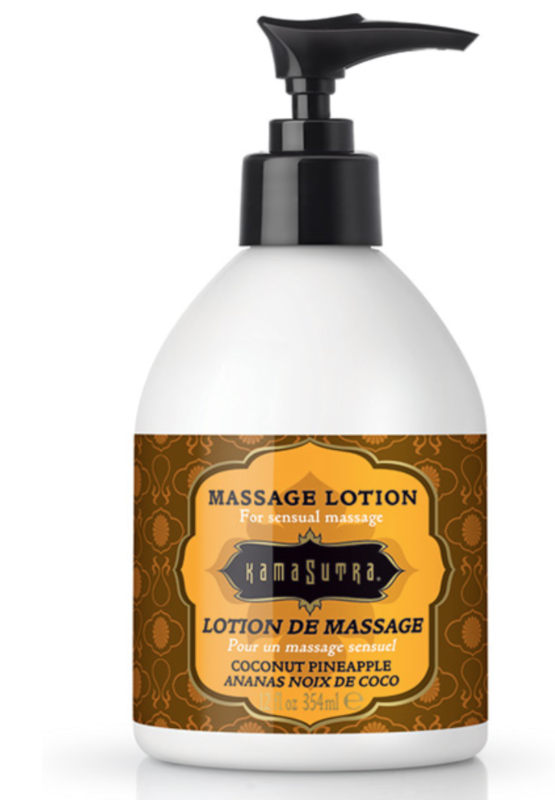 Kama Sutra's rich and silky smooth massage lotion is their most luxurious massage product yet! Luxurious as a daily lotion and perfect for sensual massages. Caress into the skin anywhere you desire luxurious moisturizing and soothing touch. Coconut Pineapple will make you feel like your luxuriating on a tropical beach while the ocean breeze wafts the scents of sweet pineapple and creamy coconut. It's like we put a Pina Colada in each bottle! Herbal Renewal will make you feel restored and refreshed with it's soothing mixture of lavender, cardamon, rosemary, sage, black pepper, clove, nutmeg, and juniper essential oils. Strawberry Dreams has the most outrageously delicious scent. It's like they put a summer field full of juicy, sweet, perfectly ripe strawberries in each bottle. Vanilla Sandalwood is exactly as delicious as it sounds- creamy vanilla with exotic sandalwood.